As is obvious from this blog, I love food. And although a majority of the recent posts have involved my own kitchen exploits, you’d be wrong if you thought that meant I confined my eating to the products of my own kitchen. Indeed, I go out of my way to sample and regularly patronize area restaurants. In fact, I fancy myself pretty well-versed in area restaurants. 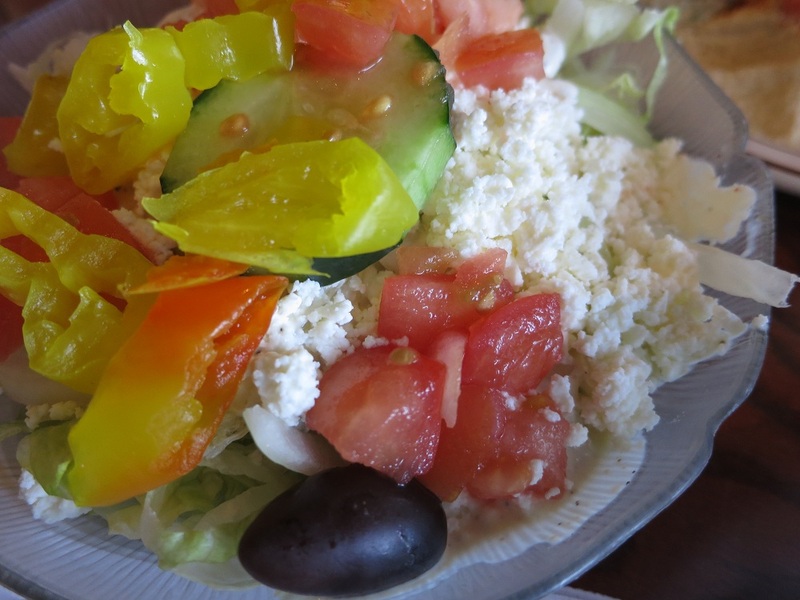 The greek salad, a perfect delivery vehicle for Nazareth’s fantastic house dressing. It was lunchtime, and lunchtime means sandwiches. Amusingly enough, Tania and I opted for the same thing: the spicy chicken shawarma. Great minds think alike. Having not been to Nazareth before, I was completely unaware that their sandwiches are monstrous. 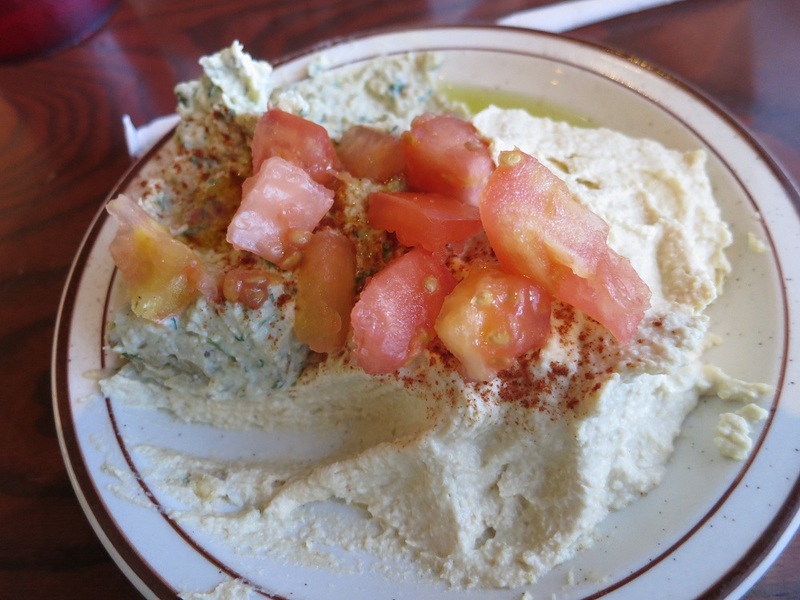 Therefore, I convinced Tania that we needed to also order a hoummus/baba ghannoug appetizer to split. And I ordered a greek salad as well. I can say for sure that I needed nowhere near the quantity of food that we ended up with. My over-flowing spicy chicken shawarma sandwich. To begin with, it is almost impossible to understand how one little pita can hold so much sandwich. Actually, check that. It can’t. As I tried to wrap my mouth around my sandwich without looking like a fool and making a mess, half of the sandwich ended up in the basket it came in. This was a godsend. It allowed me to enjoy the sandwich twice: first via pita, and then via fork. And enjoy it twice I did. The chicken was incredibly flavorful and delicious. It wasn’t overwhelmingly spicy, but had just a little bit of kick to it. I’ve had quite a few pitas, gyros, and shawarma over the years, and it takes something truly special to stand out as original. 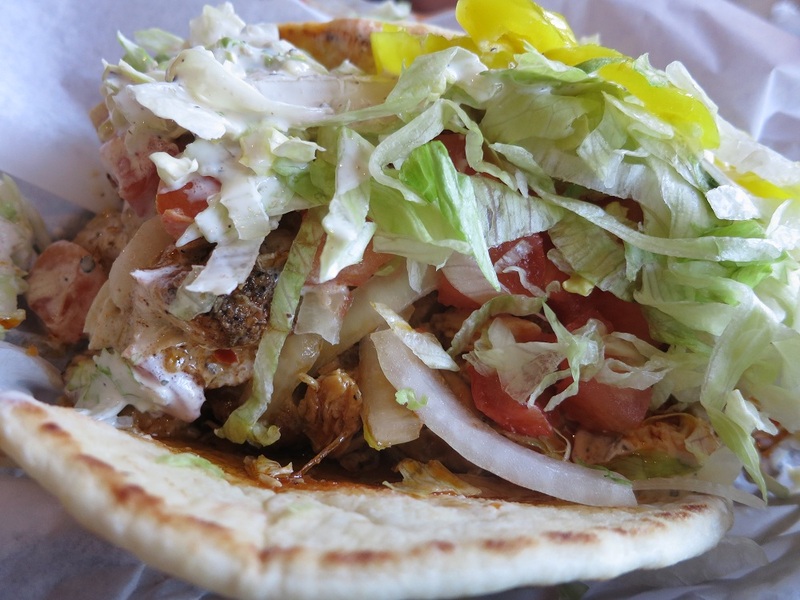 The spicy chicken shawarma at Nazareth is original. Our appetizer, with more than a few bites taken from it. We were hungry! We couldn’t wait to eat until after the pictures! The appetizer we had was also terrific. Wonderfully flavored, it was obviously freshly made. The baba ghannough featured perfectly roasted eggplant, and contained several large eggplant chunks. Almost everywhere seems to have hoummus on their menu these days. But Nazareth’s offering demonstrates the gaping divide between those who know what they’re doing and those who don’t. If anything, the salad was the weak point of the trio of items we tried. That’s only if you’re focused on the “salad” concept though. The bed of shredded iceberg lettuce really just served as a delivery vehicle for the generous portion of feta cheese, and more importantly Nazareth’s absolutely delicious house dressing. All in all, it was a delicious (and affordable!) meal. Certainly one worth driving up to the north side for. I’ll be back. But before that happens, Borgata, I’m coming for you! You are correct, Borgata Pizza Cafe is closed on Sunday’s, their website is updated but it is definitely worth the trip if you are on the North Side of Town.